The pilot explains that Earth is not just an ordinary planet. It has numerous kings, tipplers, geographers, conceited men, and businessmen—all in all, around 2,000,000,000 grownups. To give further evidence of Earth's size, the narrator says that before the invention of electricity, there were 462,511 lamplighters. They would create quite a spectacle, lighting their countries' lamps in succession, all except the lamplighters on the North and South poles, who would only be busy twice a year. The pilot suggests that Earth is a collection of grownups who all share the faults of the men the little prince has encountered on his journey so far. Cao, Diana. "The Little Prince Chapter 16." LitCharts. LitCharts LLC, 17 Nov 2013. Web. 20 Apr 2019. Cao, Diana. "The Little Prince Chapter 16." LitCharts LLC, November 17, 2013. 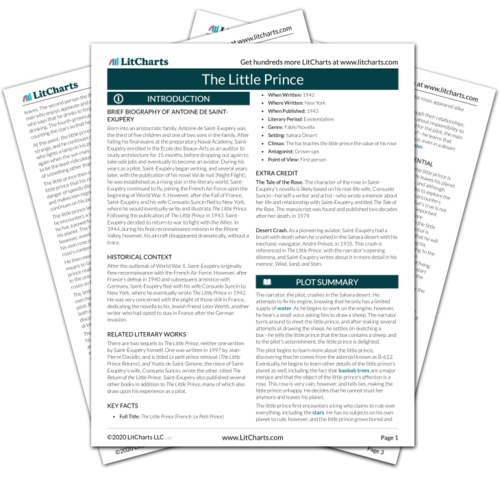 Retrieved April 20, 2019. https://www.litcharts.com/lit/the-little-prince/chapter-16.